Last week Andrea and I went to the Southwark Playhouse to see basically one of my first ever musicals. I am not the theatre type but I must admit it was very funny and for the opening night of The Toxic Avenger, they did an amazing job. Before I started to write this post, I was talking to my Grandpa about where I had been this week and he said that he knew of the Skylon (festival of Britain) in 1951, where a structure was built on the Southbank. It was a cigar shaped structure that looked as though it was floating. It is no longer there but it's history remains through the restaurant. Before our date, I had heard about a restaurant on Southbank that I knew was close to the theatre. Skylon is based in the Royal Festival Hall to which you wouldn't really know it was there as it is hidden upstairs. A undiscovered gem unless you already know about it. 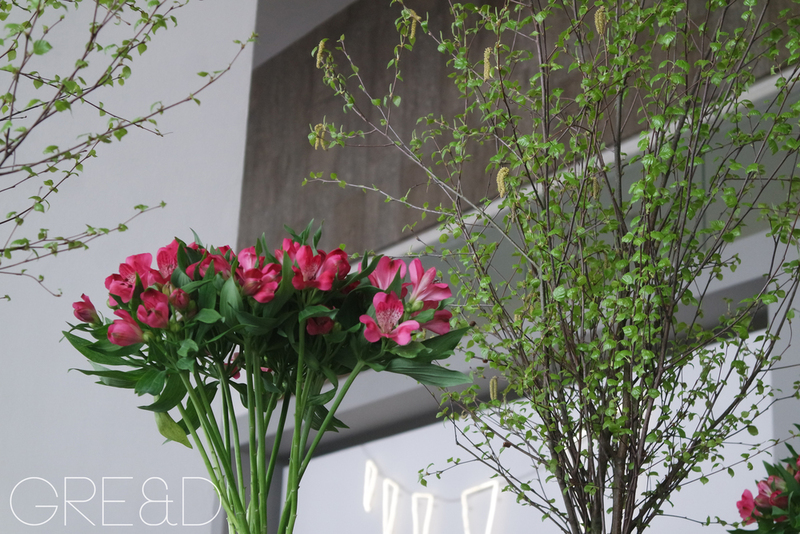 Entering you are welcomed by the abundance of light as a whole wall is floor to ceiling glass windows which overlook the river as well as the beautiful London landmarks. It's amazing as all the interiors are quite dark and this is met seamlessly with the amount of light. We were seated in the grill as I had already booked a table. I was a little sad not to sit next to the gigantic window as I am a bit of a sucker for window seats. (It also makes wonderful lighting for pictures!). But nevertheless it was a lovely seat. The whole place was very open plan, it had raised platforms for the bar which then separated the grill from the restaurant. I couldn't believe how busy it was. It was full of business meetings and private parties. I think that it is a great spot for a quick lunch as there are so many offices around the Southbank that that's probably most of Skylon's cliental. As you know, I am Queen of the Set Menus! So surprise Andrea and I had the grill set menu compared to the restaurant set menu. We decided on three courses for £25 including a glass of wine. 2 courses at £20. Such a great deal for a lovely location especially for the view. Shocker, Andrea and I both ordered the same starter (we're getting worse at this) and ordered the Smoked haddock chowder, slow cooked egg & english asparagus. My uncle every family occassion makes this dish, obviously to his own palette and adds sweetcorn and crushed potatoes to add texture. So I knew that I wanted to have this. The first mouthful Andre and I just looked at each other and we were both in our element. It was creamy and rich. The egg was just cooked so when you broke into it is oozed a little but was mostly solid giving the soup the richest flavour. What was lovely, was the asparagus was still slightly crunchy which added texture to the dish. 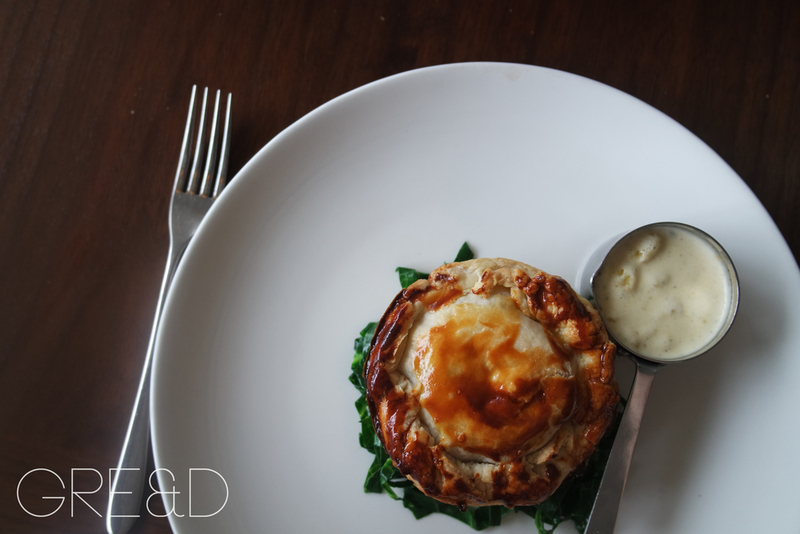 For main I was really struggling what to choose but I went for a vegetarian option because I never normally pick that when I go out to eat, Stilton heritage potato and leek pie with spring greens. Andrea went for another hearty dish the Shepherd's pie, braised lamb shoulder, mash potato, carrots and peas. It looked amazing, something that your grandmother would cook made with love. Both dishes were packed full of flavour. The pastry on my pie was cooked perfectly, it was crunchy and then on the inside light and fluffy. Dessert was like a tug of war. Again Andrea and I both wanted the same pudding but we knew we had to order different things as it did all sound very good. We both decided that we would order two different ones and share (I know how cute). 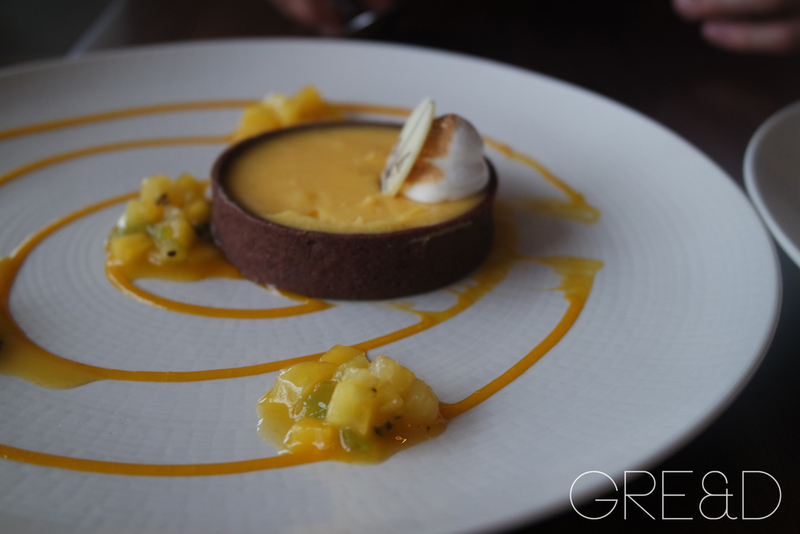 I ordered the Passion fruit curd tart, exotic fruit and mango gel. The other, Chocolate and pecan brownie, chocolate cremeux, caramelised popcorn & salted caramel ice cream. I knew what one I wanted... When both arrived, the presentation was great. They both looked too pretty to eat. We tucked into both and then we immediately swapped plates! Andrea is more of a fruity person for desserts while I like indulgent rich ones. For me, the star of the chocolate dessert was the salted caramel ice-cream. Eating it, if you left a small bit in your mouth, you could feel the rocks of salt which was amazing that that the ice-cream was not full of flavour but texture too. It reminded me of eating popping candy. Salted caramel is also my favourite flavour of anything so it was winning for me. Also the popcorn. Basically everything was great. We came away feeling quite full which is unusual for Andrea! We both said that it was lovely to go there as it wasn't like we wee breaking the bank while receiving great food and a great view. The waiting staff were all men and mostly all Italian! They were all so lovely and it wasn't as though we had one waiter all the time, they constantly changed so we had different personalities all the time. 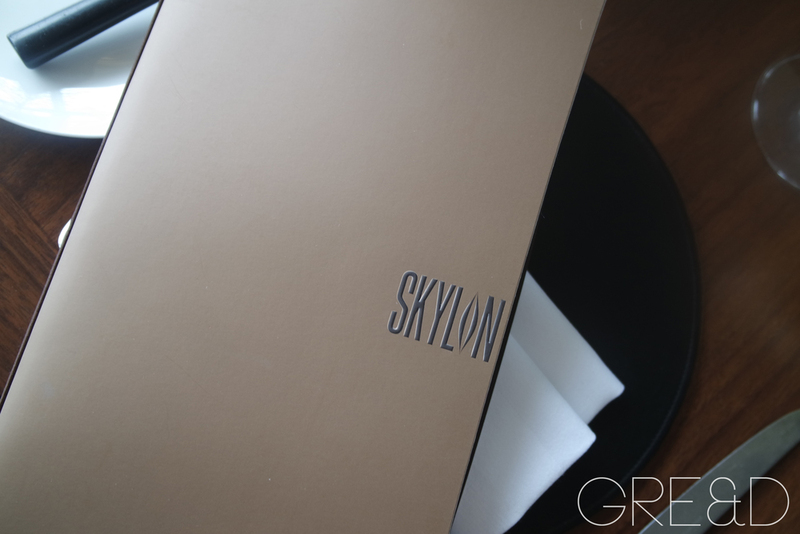 I also thought that the presentation of the dishes were beautiful and even looking on Skylon's website you can see from the imagery that everything they do is executed with perfection.